I really don't know anything about Wolverine, except that Hugh Jackman played him in a few movies, but I don't even know how many there were. My brother had some Wolverine comics and he had interesting stories. One of my favorite things was how feral he could be in certain arcs. I've heard he's a favorite character of many. I only know the Hugh Jackman version, but I like that version. 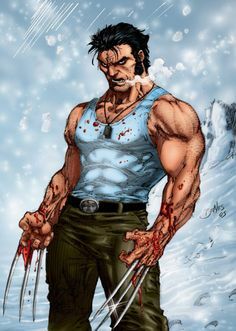 Wolvie :) I have to admit he wasn't one of my fav until Jackman, but I have come to pay more attention to him since and he's a great character.